At over 600 pounds and exceeding 6 feet in length, the Giant Armadillo must have been one heavy land tank of an animal. It is believed these creatures spread to Florida during the Pleistocene from their original domain in South America. It is still a mystery as to what they ate. 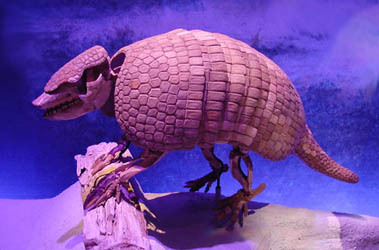 Modern armadillos eat insects but to sustain 600 pounds of body mass would have required some other type of food source. About 9800 years ago, a dramatic shift in the climate caused their extinction in Florida. In North America, there are two species of Holmesina that are known with both based on Florida finds. The smaller animal is named, H. floridanus and lived during the late Pliocene on into the early Pleistocene. Floridanus' larger cousin at more than twice its size, H. septentrionalis, ranged from the middle to late Pleistocene.